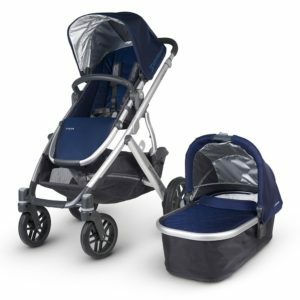 Valco Baby has been producing baby products in Australia for over 20 years and has recently started selling their baby strollers in the USA. The Zee is very easy to push and steer with one hand. I am 5′ 4″ and certainly not fit but I have no problem pushing this stroller with my two babies (weighing 50 lbs). The lockable front wheels make it much easier to go over loose surfaces such as gravel. It is Narrow enough to fit through most doors and all but the narrowest of shopping isles. I have had no problems in crowded streets. The rear suspension leads to a very smooth ride for baby but I think that if the front wheels were just a little bit bigger, the ride would be even better. With just a little practice, the Zee is easy to fold and unfold. There is no automatic lock when folding but it does have straps and clips to hold the frame in position. 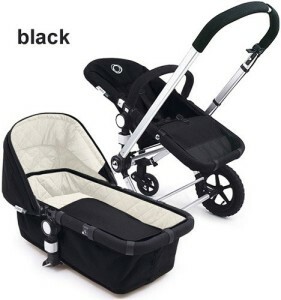 When opening the stroller, it does automatically lock into the open position. When folded, the Zee takes up relatively little room even with the wheels attached (see dimensions above). Folding can be a little tricky at first but you soon get used to it. Weighing less than 30 lbs, it is fairly easy for me to lift it in and out of my trunk. There are two seats and they can recline individually. The seats are very well padded. The recline can go fully flat and this is essential for newborn babies. Each seat has a five point safety harness that is very easy to use. If you want to carry a third child, you have the option of buying a joey seat. This is a seat that sits in between the two seats and at a higher level. There is also a carrier attachment and a hitchhiker board for an older child to stand at the rear. There is an option of a third toddler seat that can be fitted between the two stroller seats (at a higher level). This stroller is not equipped to carry a bassinet. Each seat has its own canopy and there is a zip fastener that allows the canopy to extend even further if required. The cargo basket is enormous and is better than most other brands. It is one, large net basket and is accessible from behind the seats. It truly is big and easy to access. I love it. The two rear wheels have suspension that really helps smooth out the ride. The two front wheels can swivel or be locked into position for rougher surfaces. All of the tires are tubeless so you will never have to worry about getting a puncture. My big gripe about this stroller is that the handlebar is not height adjustable. It was fine for me but not for my partner who is 6′ tall. 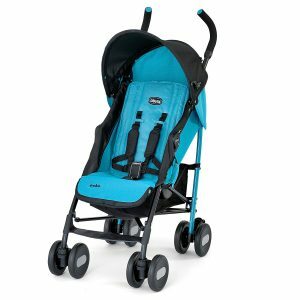 The Valco Baby ZEE Two stroller is a great all rounder. 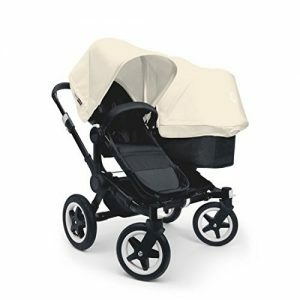 It is much more robust than an umbrella stroller but not as tough as a Jogging stroller. 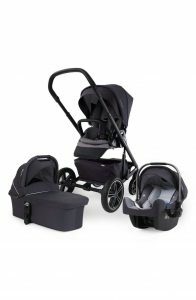 It is light for a double stroller and it is just the right size for crowded city streets. This is really an urban stroller but will be suitable for occasional of-road use. 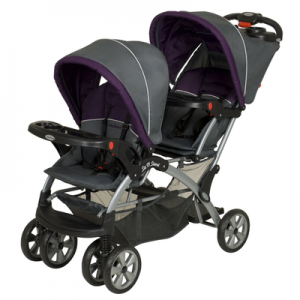 We liked this stroller for its ease of use, maneuverability and compactness. It can be expanded to hold a third child. Although suitable from birth, it does not accommodate a bassinet. This stroller is good value for money.